Inspiration Wisdom Action Devotion Love. 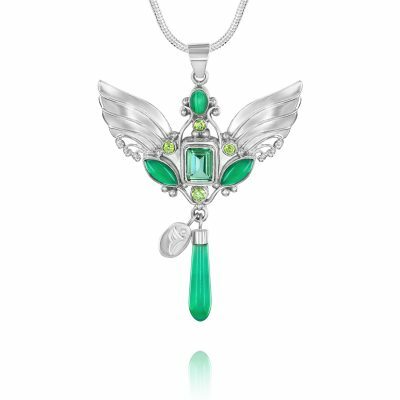 The attributes of Archangel Uriel are magnified and energetically supported by 4 powerful gemstones. Pink Tourmaline, Ruby, Garnet and Rhodolite. 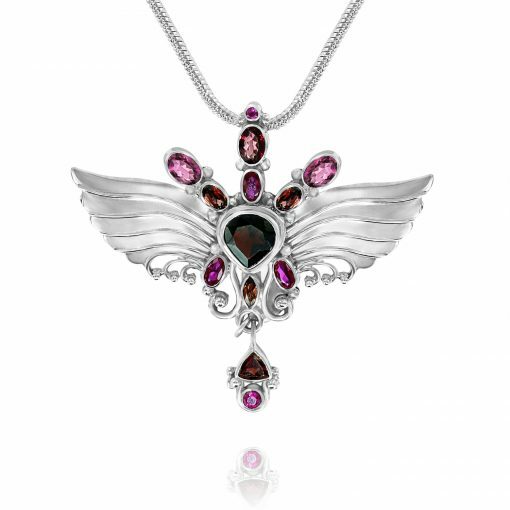 This Archangel Uriel necklace is handmade, which means quality and a whole lot of love. 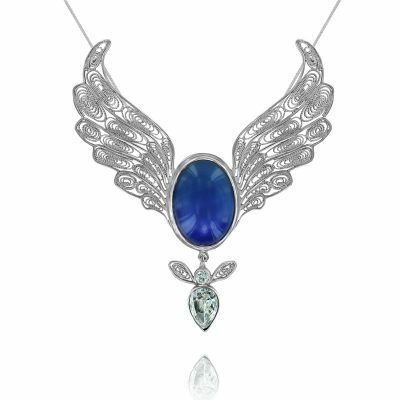 Between pure, silver wings rest 13 glorious gemstones which are specifically chosen because they symbolize and intensify the characteristics of Archangel Uriel – energy, and commitment. 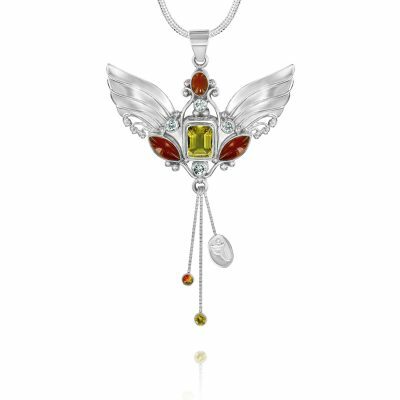 The Archangel Uriel necklace is a pendant of great vitality, inviting qualities of insight, wisdom and devotion. Known as “The Light (or fire) of God” Archangel Uriel illuminates our path ahead, shedding light where there is confusion and offering solutions and clarity. Like all my pendants, it comes in a satin lined box and is ready to wear with a chain included. Pendant size 5cm x 5.5cm. Posts worldwide. 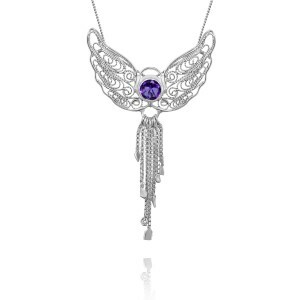 I absolutely love the Archangel Uriel Necklace and was so excited to wear this exquisite piece. Immediately upon wearing it I could feel the energies of love, intention and devotion. Thank you Linda for each and every piece you create. ???? Hello from Bulgaria. I received the necklace today. 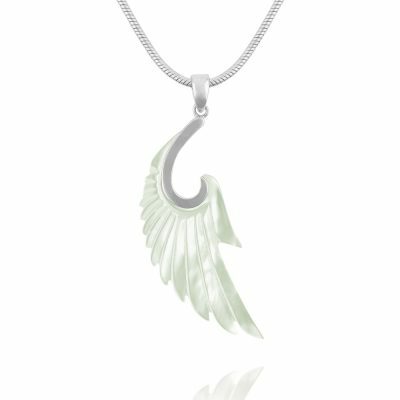 I love my angel pendant but the 18″chain was not long for me. It would better to be 20″ long for me. If you can send a long chain that would be very good. Can I buy it? Hi, I just wanted to thank you for your exquisite creation-Today I received Archangel Uriel necklace as a birthday present and I am so thrilled! It’s beautiful and wearing it carries such a connecting special energy. 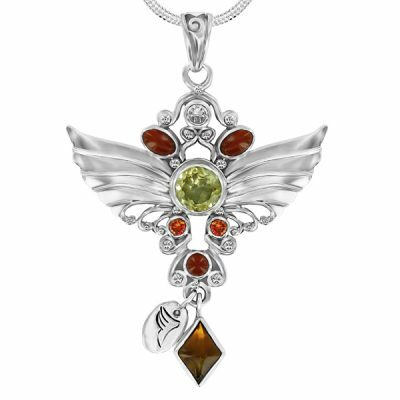 Archangel Jophiel Pendant. Laughter, Joy, Abundance.